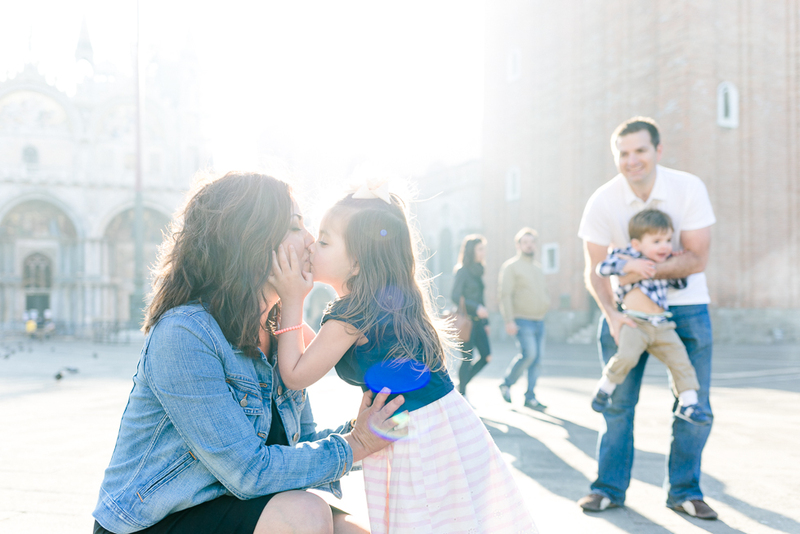 When Stacie contacted me about capturing her young family in Venice, we both realised quickly how much we’re on the same page about how we imagine family photo sessions to be: stiff poses – no thanks, instead we’d always go for a natural ease and the happiness of a family being together showing through. Basically, my photography mantra – spontaneous, honest and flowing! So on a beautiful Sunday morning, we all met on Piazza San Marco for a family shoot, and as it was the family’s first visit to Venice, their little ones Charlotte and Rab had so much fun running around the huge piazza chasing the doves and watching the gondolas bobbing up and down in the water for the first time. Stacie and Bo are an American couple from Texas and Wisconsin (which got me excited as ten years ago, I worked and lived in Madison, Wisconsin, for six months. Naturally our conversation turned to a local speciality called cheese curds, to life at the lakes and the funny names of Wisconsin places such as Waukesha, Wauwatosa, Waunakee, Waubesa). As a family, they get around in the world a lot for work and after a couple of years in Japan and then back in the US, their home at the moment is an hour outside of Venice. 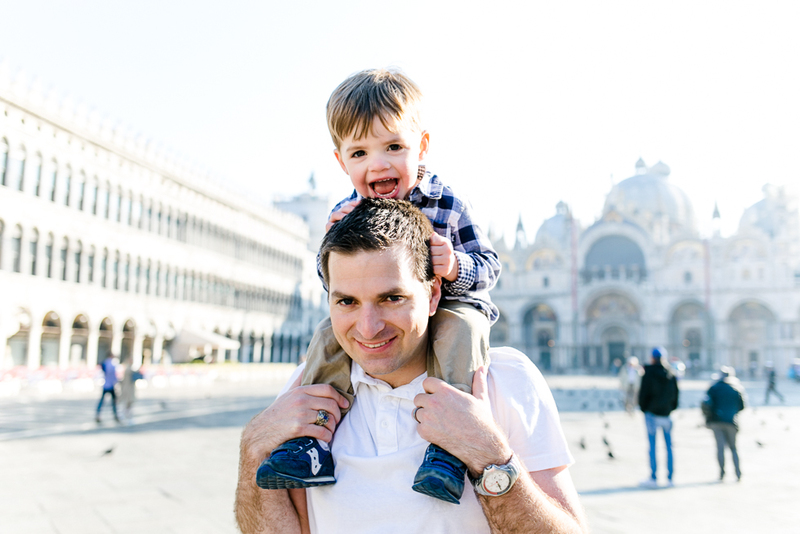 Sure they wanted this dolce vita moment in their lives to be captured and to be cherished forever, the story of their fun loving family in Venice to be told with beautiful photos. After all, time passes so quickly and before we know it, a special moment, or another year is gone, especially with the little ones, who seem to grow up so fast. 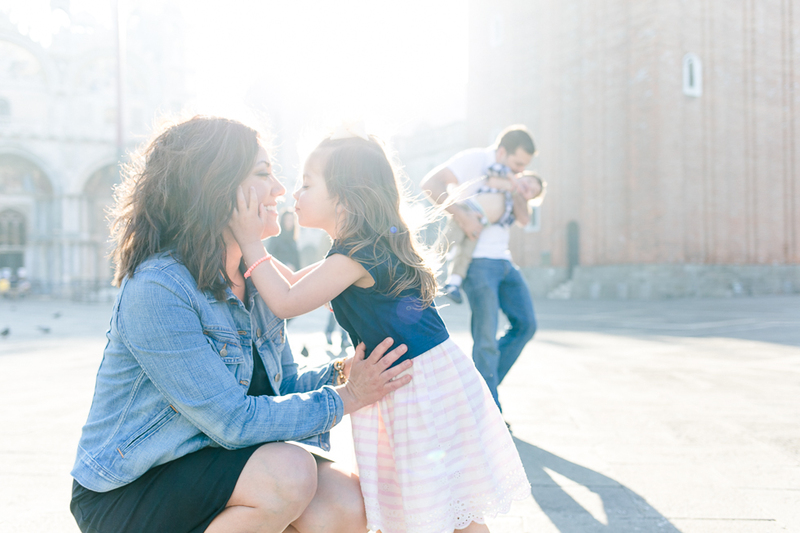 That’s why a (family) photo session is one of the best gifts we can give ourselves! A moment in time, preserved as a timeless present for us and our loved ones. Are you coming to Italy and would love to have special keepsakes of you and your loved ones with an Italian backdrop? Drop me a line.